I am about to blow your mind. 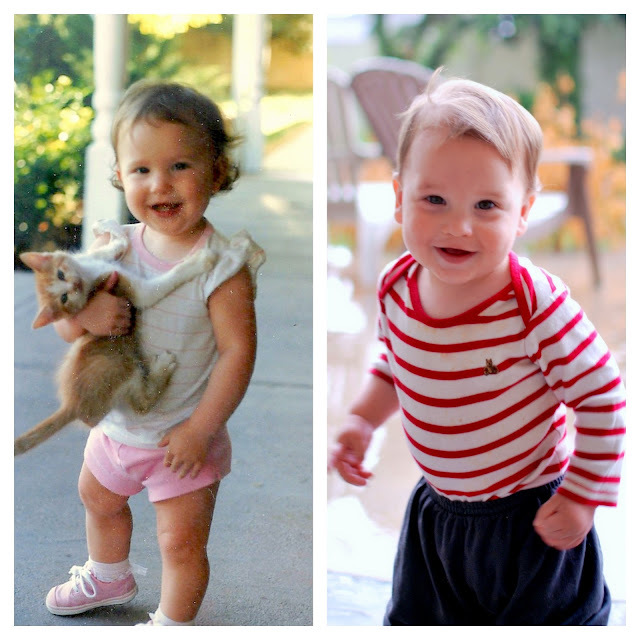 Check out this side-by-side picture of me when I was a baby and this picture I took of Fritz the other day. I always thought that William looked a lot like me because his has my same brown eyes but I've recently been noticing how much Frederick looks like me when I was a baby. I can't get over the similarities! Also, how hilarious is that poor cat? Poor thing. Duh, I keep tell you that! And is that one of Betsy's kittens????? I have always thought you have had 1 Bryant baby and one Nielson baby...both delightfully cute. What blew my mind was the fact that kitten was just chilling. Look at how cute you two are! Wow!! That's crazy stuff!! Like twins! I'm in love with you holding your little kitty and your cute pink little shoes. So adorable! !